"When I first read about the Rebel 20, weeks before it's actual release, I could hardly believe it: it sounded as if someone had read my mind! When I finally had the chance to actually play one, my mind was blown. They were hard to get at the time, but the next one to show up at my local GC came home with me." Jim knew that music would be his primary pursuit from the time he picked up a plastic guitar at age 10. Like most kids, he figured his job title one day would be “Rock Star.” By 14 he was playing in local coffeehouses, joined his first gigging bar band at 15, hit the road playing a solo act at 19 after spending a fitful year in the Jordan College of Music at Butler U. Tiring of the road, he took what he thought would be a temporary job as an advertising copywriter. “Temporary” became 15 years. He wrote commercial music throughout this career as a copywriter, winning a couple of national awards, and founded and worked as the primary writer and director of the Renaissance Radio Theater, winning a “Best Drama” Award at the International Radio Festival in 1988. He began doing business as Gravity Music in early 1995, moonlighting from his agency job until January of 1996, when Gravity Music became a full-time passion. Since then he’s written music in every conceivable style for virtually every application for local, regional and national clients. He also wrote the popular “Guest Room Warrior” columns (on the business of a home studio) for Keyboard and EQ magazines for many years. You can hear samples of Jim’s work at www.gravitymusic.com. He has played virtually all the guitar, bass and keyboard parts on his productions, programmed drum tracks and played hand percussion on the majority of them, and still sings background vocals and the occasional lead on a jingle. He is finally releasing his first album of original, “non-commercial” instrumental guitar music, entitled “Moonlighter,” in the summer of 2011. 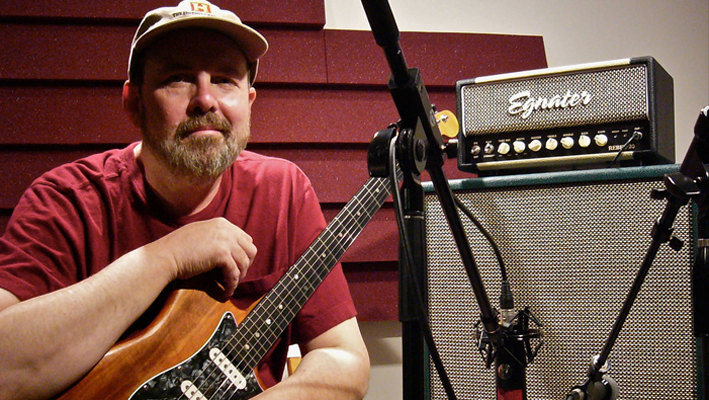 More quotes from Jim about Egnater Amps. I’m not an artist chasing one specific guitar tone: I’m a working pro who is called on to reproduce dozens of different guitar sounds, depending on the production. So for years I relied on modeling amps and software to get the kind of variety, speed and ease of use the gig demands. Always looking for better, more authentic sounds, I tried a string of tube amps. Either they were too expensive to justify their cost (in my studio every piece of gear has to work hard or it goes), too unresponsive, too loud, just plain bad sounding or one-trick ponies that sounded great at one specific setting. I used to daydream of a great sounding amp that could do nearly everything and that didn’t cost 5 times what it was worth. Since then, I haven’t used my modelers even once. From shimmering Fender-y tones to Marshall-esque crunch and high-gain face melting, at virtually any volume, the Rebel 20 is exactly the Swiss army knife amp I had dreamed of. It takes front end pedals extremely well (sounds absolutely awesome with my Hermida Zendrive), and the effects loops is ultra-clean, perfect for the time-based effects and reverbs in my Line 6 M13. I can play surf guitar in the morning and a jazz gig in the afternoon… it is, simply, the amp that I would have designed myself. The Rebel series are the ultimate studio amps, and I continually tell anybody who will listen not to buy another guitar amp until they’ve played an Egnater.